The Mint Museum in uptown Charlotte is a great place to view and enjoy many different types of fine art. Although placed in a contemporary building, the art itself resembles what would be found in a prestigious museum, such as the Museum of Fine Arts in Boston or The Metropolitan. The Mint Museum is very different than its neighbor the Bechtler. Both have similarities in their architecture and program, however the spaces have different feelings. I’d like to approach the Mint as an architectural space and how it affects the visitor’s experience in the museum. Most museums have a lobby, or some sort of large gathering space in the front or center. This will always serve as a landmark, something to locate oneself with as they roam from gallery to gallery. The Mint Museum is different in that the lobby space is located farther back. At first you enter into a small foyer, with low ceilings. This small space gives way to the large open space—a concept that was called “compress and release” by Frank Lloyd Wright. The lobby has escaladers that bring people to the galleries on either side. This is a very large space, and seems to form an uncomfortable void between galleries. There was very little furniture and not much to view. This to me is the architectural failure of this building—the space does not engage its occupants. However, it becomes significant once in the galleries. Small openings and apertures allow views across. The windows and doorways throughout the galleries form frames around the objects and pieces in the gallery, forming foreground, middle-ground, and background. 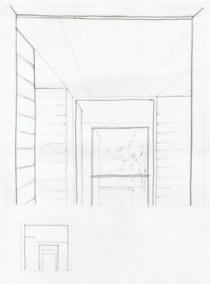 This way we perceive the depth in the galleries, can be translated into drawings. In this way the architecture of the space becomes related to the art that it houses. For this response I took the idea of a framed opening in architecture and created a pencil drawing from a view inside Storrs. It is interesting to see how the doorways create a view to the outside and add depth to the drawing by overlapping elements in the middle-ground and background. The Mint Museum's galleries are interesting to walk through because of the the views across the space made by openings. I thought that it would be interesting to see how this could look in a drawing and to examine what it does in other types of spaces, in this case the School of Architecture buildings.